1. MiKu's AH-56A Cheyenne has finally arrived. 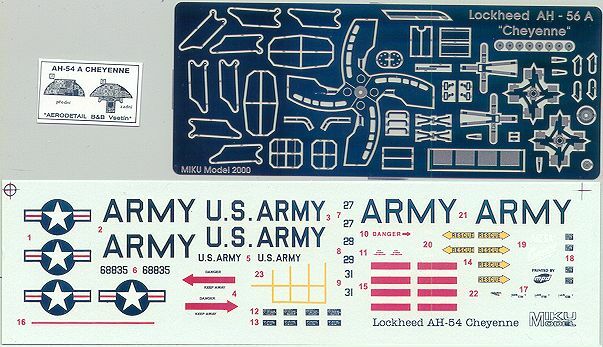 This kit (#72066) comprises about 55 resin parts, a sheet of etched steel with 74 parts, a decal sheet, a single vac-form canopy, and a pair of printed instrument panels. 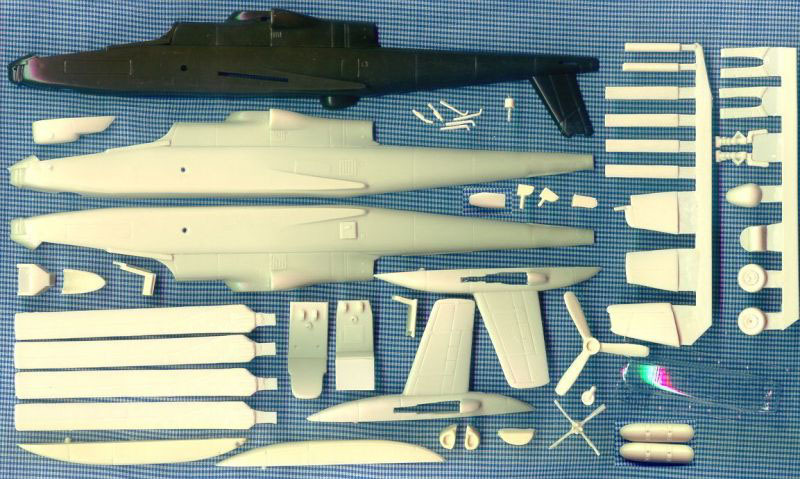 The major components - fuselage, wings, fins, fairings, canopy, etc. are clearly derived from the Aurora kit which dates back to 1972, one piece of which is shown for comparison. This comes as no suprise because we know that Miku were sent one of these to work from a year or so ago. Most of the smaller parts are new, with the main elements of the rotor-head coming on the steel sheet, along with undercarriage doors, seat armour, harness, access steps, etc. An attempt is made at weapons pylons and some stores, but I find it difficult to be sure what they are intended to represent as the larger pair seem to have gone missing somewhere on my work-bench, they are either tanks or bombs. There is also provision for the underbelly 30mm cannon housing which was fitted to 66-8831. The hand-drawn instructions are printed entirely in Czech, and would not be sufficient for building the model without the help of additional references, but they do contains a few detail views copied directly from the Maintenance Manual - for example the main rotorhead drawing. Colour scheme and marking diagrams are given for four different groups of aircraft, with paint colours from the Humbrol range. 66-8831 is shown in a camoflage scheme of green, olive drab, tan and black. 66-8831 is olive drab, 66-8829 is olive drab with a black anti-glare panel and an 'AH56A Cheyenne' logo on the nose, while 66-8827, 66-8829, and 66-8835 are again plain olive drab. The smaller markings and stencilling vary from one group to another. This kit sells in the Czech Republic for only CZK350. MiKu's address is given as: Opletalova 130, 284 01 Kutnб Hora, Czech Republic; phone 0327-762-493. Their distributor is Ilona Mullerova and both The Aviation Workshop and Aeroclub have imported other MiKu kits into the UK in recent times. The Lockheed Cheyenne website has recently been updated to include pages for the CL-475, XH-51 and L-286. 2. Extratech's Aйrospatiale SA-315B Lama, arrived at the same time (#EXA7202). If you have seen the previous kit from Extratech, (#EXA7201, the Alouette II), you will not be suprised to hear me say that this is an outstanding kit. You get a nicely produced box, top quality multi-page instruction leaflet in Czech, French and English, two etched brass frets, a decal sheet, an acetate instrument panel, a vac-form canopy, and 32 finely detailed and superbly moulded resin parts. Although I haven't had the opportunity to build it yet, I have seen the Alouette completed in Swedish colours, and it looked beautiful. 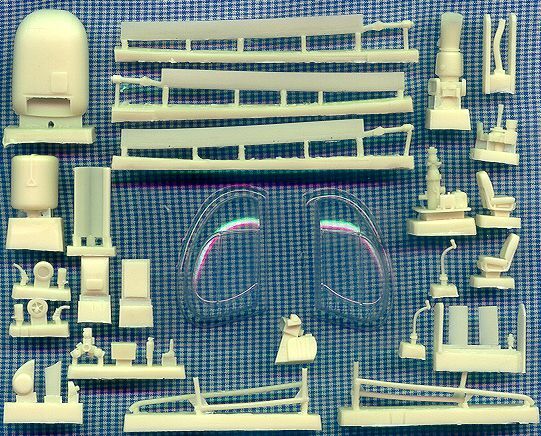 Comparing the resin pieces with the Alouette, the most notable differences are in the shape of the fuel tank (cylindrical rather than cuboid), the different engine, and the taller skids. There are a number of other minor differences. While some elements of the main brass sheet are copied from the Alouette, a lot of it is new, including the tail-boom assembly and the three-bladed tail rotor. Also new is the smaller etched sheet which makes up into a pair of skid-mounted baskets. Indian Army Z3212, which is dark olive green, and is provided with an under-slung lifting frame and hook. Argentinian Air Force H-67 (see HKN #86), orange, with skis and dust filters. Chilean Army 157, olive drab, with the external baskets. I do have a few minor criticisms (of course). The centre spots of the Indian roundels are off-register, and the main rotor blades are slightly warped. This kit is available in the Czech Republic for CZK678. Extratech's address is: Extratech Ltd., Podstrбnskб 7, 627 00 Brno, Czech Republic, and their distributor is Ilona Mullerova. There will be a review of the new Mach 2 kit of the Alouette II next week. 3. Returning to the Italeri AB.204 #1201 just once more, since I've finally seen it myself, I note that the fuselage profile with its extended tailboom matches exactly the profile of a USN UH-1F. Also of interest is that in re-arranging the #040 UH-1B sprues, Italeri have taken care to include a roof-mounted pitot and an extra blade aerial (two in all) which are not used in the construction of the AB.204. 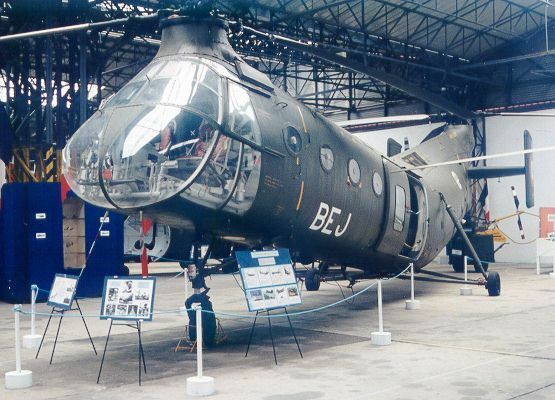 Coupled with the sighting of a test-shot of an Italeri UH-1F engine housing (HKN #79), it seems that an Italeri UH-1F is still on the cards, sometime. I suppose its asking too much that they do something about this ridiculous 40ft / 21" main rotor while they are at it. Italian Air Force SAR 15-29, dark grey and green camoflage with a broad yellow band. Austrian Air Force 4D-BY, olive drab. Royal Netherlands Navy 225/K, dark gull grey over light ghost grey. The markings for this last option are covered in more detail by Dutch Decals sheet #72034, where the colours are given their correct names and numbers (extra dark sea grey over sky), and all the possible serial options are provided, along with 1 Sqn and 7 Sqn badges. #72034 also includes markings for Netherlands Navy S-55's and S-58's. 4. The Italeri H-21C 'Gunship' #1203 is pretty much as previously reported, the extension to the main sprue includes a pair of external fuel tanks for the USAF version, plus the armament for the gunship - an MG151 20mm cannon in the forward cabin door, a pair of machine guns attached to the front u/c strut, and a pair of 19-shot rocket pods. In reality these should be 18-shot 68mm rocket pods, but nobody will notice. USAF 115858, red over silver (but a different pattern from the ones illustrated in HKN #89 & #90). The French gunship, which doesn't carry any serial, olive drab. An unarmed French version serialed BEJ, also in olive drab. This last example is preserved in the excellent ALAT museum at Dax in south-west France, where I saw it in 1997. Meanwhile, the Creator of KGWings has posted an excellent set of photos of his model of an H-21A in French Navy markings. The instruction sheets for both the AB.204 and the H-21 include a small printed slip to be cut out and used for the ordering of replacement parts - the first time Italeri have openly provided this service, as far as I know. 5. Hannants have taken delivery of the JMGT 1:48 Loire et Olivier C.130 autogiro kit, priced at Ј45.00. I won't be reviewing this one in the forseeable future. 6. 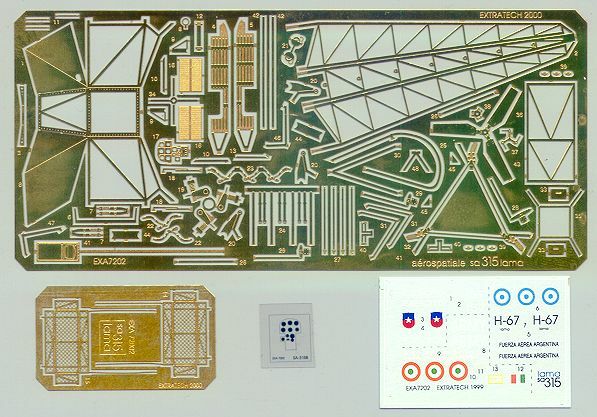 The Rotorcraft BK-117 conversion for the Matchbox / Revell kit will include new engine cover, boom, filter housing and hoist and some etched parts. At a later stage they may include the weather radar nose as seen on Nelson Mandella's VIP ship. Their Oryx conversion is nearing completion, but I'm still waiting for the pictures of the parts to appear at the IPMS South Africa website. 7. Zvezda have launched their new kit of Ka-27 (#7214). You can read all about it and see the pictures at the new English version of Heliborne. 9. Kiwi Aircraft Images posted this on the rec.models.scale newsgroup. "I've finished the series on NZ military helicopters that I began at the start of the month with with the Kaman SH-2F Seasprite (47 images). The second update this month completes the series with the addition of the Bell Model 47 'Sioux' (16 images), and updates on the UH-1H Iroquois (32 images), and Westland Wasp (6 images). These include internal, detail and 'action' photos." Also available is a set of 1:32 scale RAN 'Tiger' decals for the SH-70 Seahawk, though if you want a model of this you are going to have to build one yourself from scratch - see HKN #64 for details. #AVW-H15 RAN Squirrel set for the Gulf War including Gulf War decals. #AVW-H08 RAF Chinook HC.1 Gulf War set. In my review of the Aviation Workshop high skids and decals for the Australian Army 206B-1 last week, I referred to it as a 'JetRanger'. I have rightly been corrected on this as the helicopter is actually a Kiowa. I'm also told that Italeri's various Kiowa kits come with JetRanger doors despite showing the correct doors on the box-art, and that modellers will need to either remove the doors as is often done in service, or steal some from a Matchbox OH-58D. I haven't had time to check this out for myself yet. Thanks to Yevgeny Borissov, David Edwards, Gary Madgwick, Guy Holroyd, Colin Burgess, and especially to Petr Zaoral.